We are pleased to announce the Barbara A. Barker Vienna Summer Internship Scholarship. The purpose of this scholarship is to provide financial assistance for underrepresented students participating in the Vienna Summer Internship program and will be available to students starting summer 2019. 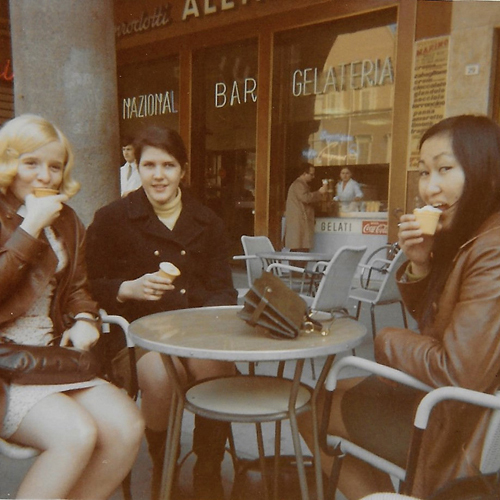 Barbara Barker (at left, center) was a member of the IES Abroad Vienna Class of 1968-69 and graduated from the University of South Carolina. Her year in Vienna, during which she discovered a passion for European art, music, culture, and travel with classmates, was life changing. Barbara passed away from a medical condition in Vienna in 1970, cutting short her newfound direction and purpose. Her father, George A. Barker, Jr., recognized the value of a global, cross-cultural experience both through Barbara’s experience, as well as through his work as the European Import/Export Representative for the Bethlehem Steel Company. He, along with David H. Hartz, Barbara’s stepbrother, have established this scholarship to honor Barbara and the valuable impact of study abroad. Learn more about other IES Abroad financial aid and scholarships for internships and study abroad.